The Hudson Bay Lowlands in northern Canada is the second largest wetland in the world, storing approximately 30 petagrams (i.e. ~5 million kg) of carbon. The microbial communities in these peatland fen and bog ecosystems are important factors impacting the turn over of the carbon reservoir, influencing the release of greenhouse gases as permafrost melts. However, few studies have investigated the relationship between the microbial communities in the permafrost active layer, the layer of soil that seasonally thaws, and the thickness. 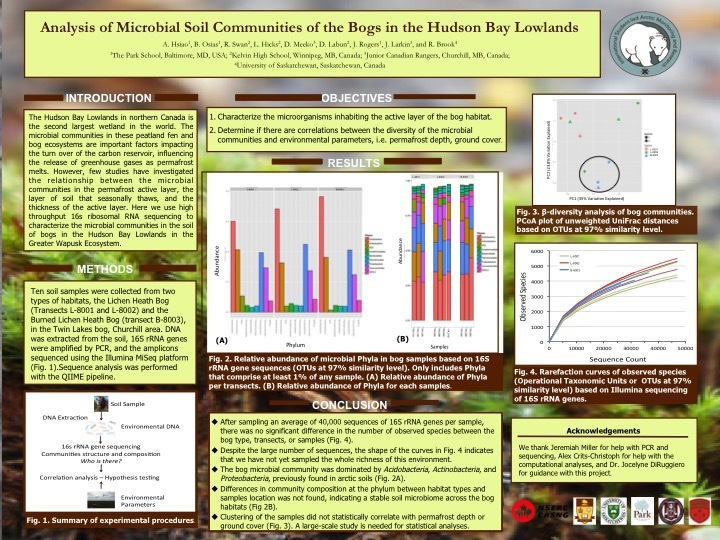 Here we use high throughput 16s ribosomal RNA sequencing to characterize the microbial communities in the soil of bogs, fens, and transitional areas in the Hudson Bay Lowlands in the Greater Wapusk Ecosystem. The sequenced data reveals the organisms that comprise the community and is used to predict the functional attributes of the organisms in the environment, and their potential as indicators and effectors of climate change. The aim of this study is to use soil microbial diversity, permafrost active layer thickness, and the type and % cover of the vegetation as indicators of climate change. Studying microbial communities is a powerful tool that allows us to investigate the effects of impending climate change in a critical habitat of the world.